Jordan-ISIS. King Abdullah returned to a warm welcome in Jordan today after cutting short his visit to Washington yesterday. Abdullah’s move followed the release by ISIS of a video yesterday depicting captured Jordanian pilot Moaz al-Kasasbeh being burned to death in a cage. Crowds gathered to express support for the Jordanian king’s decision to swiftly execute Sajida al-Rishawi, a failed suicide bomber on death row, and Ziad al-Karbouli, a former top lieutenant of Al Qaeda in Iraq, in retaliation for al-Kasasbeh’s death. Meanwhile, the New York Times reported today that the United Arab Emirates, a crucial regional ally in the U.S.-led international coalition against ISIS, suspended airstrikes in December after news of al-Kasasbeh’s capture broke, over concerns for the safety of its own pilots. The United Arab Emirates reportedly demanded that the Pentagon improve its search-and-rescue efforts and base its missions in northern Iraq instead of Kuawit to be closer to the field of battle The UAE, one of the first counties to join the coalition, will not resume operations until these changes are implemented. See my take on the implications of ISIS’ brutal killing of al-Kasasbeh in my blog post from yesterday. Egypt. An Egyptian court sentenced a prominent activist, Ahmed Douma, and 229 other Egyptians to life in prison today. Meanwhile, Canadian Foreign Minister John Baird announced yesterday that imprisoned Al-Jazeera journalist Mohamed Fahmy would be released “imminently” after the dual national agreed to renounce his Egyptian citizenship to speed up proceedings. Baird’s announcement follows the Sunday release of Australian Al-Jazeera journalist Peter Greste. Al-Jazeera promised on Monday “not to leave” behind producer Baher Mohammed, the third incarcerated Al-Jazeera journalist. The three were arrested in December 2013 for illegally aiding the Muslim Brotherhood. Egypt’s ousted president Mohammad Morsi will be tried on February 15 on new charges of espionage. He is accused of “handing over to Qatari intelligence documents linked to national security in exchange for one million dollars,” according to a statement from the prosecution. Morsi could face the death penalty if found guilty. 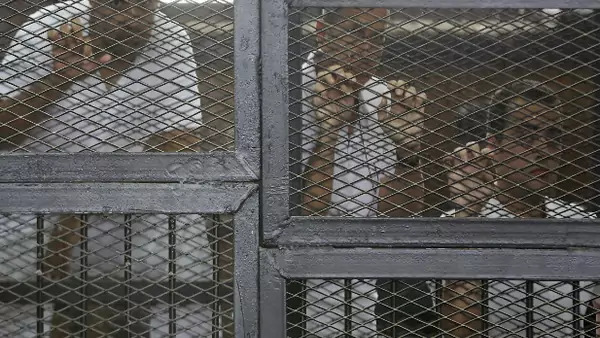 An Egyptian court upheld death sentences against 183 supporters of the Muslim Brotherhood on Monday for killing eleven police officers and two civilians during protests in 2013. The United Nations called the verdict “unprecedented in recent history” and said that the expedited trials failed to follow due process. Diplomatic budget for 2016. President Obama is seeking $50.3 billion in spending for the State Department and USAID to spend in 2016. This figure represents a 9 percent increase in funds compared with the 2015 fiscal year. Of the $50.3 billion, Obama plans to allocate $3.5 billion to support regional partners in the U.S.-led international coalition against ISIS, to provide humanitarian assistance, and to strengthen the moderate Syrian opposition. $1.1 billion of the requested budget is to be allocated to support diplomatic engagements in Iraq. An extra $4.8 billion has been requested to increase the protection for diplomats worldwide. The Benghazi Accountability Board, established in the wake of the 2012 killing of U.S. officials in Libya, recommended these security upgrades. Palestine. Palestinian Authority President Mahmoud Abbas called for an “immediate investigation” on Monday into a cartoon depicting the Prophet Muhammad published on Sunday by the West Bank-based newspaper Al-Hayat al-Jadida. According to one of the newspaper’s editors, the cartoonist, Muhammad Sabaaneh, and the editor in chief of the paper were suspended yesterday. Sabaaneh denied that the cartoon was meant to represent the prophet, arguing that it aimed to depict a “symbolic figure for Islam and the Muslim’s role in spreading light and love for all humanity.” Abbas joined world leaders to march in favor of freedom of expression in Paris last month during a mass rally commemorating the attack on the French satirical newspaper Charlie Hebdo. Yemen. UN-mediated peace talks appear likely to fail after Yemen’s main political parties withdrew from the negotiations on Monday. This comes after Houthi rebels issued a three day ultimatum on Sunday stipulating that if the rival political parties failed to reach an agreement by Wednesday, the Houthis would completely take over the government. The Houthi rebels also demanded that fighters from their militia be integrated into the Yemeni army and police force as a precondition for talks. Tunisia. Tunisia’s prime minister-designate, Habib Essid, announced a new coalition cabinet yesterday after the first government he nominated was rejected for being all-secular by Ennahda, the main Islamist party and the second largest party in Parliament. The new cabinet includes a minister and three state secretaries from Ennahda. The proposed government will be put before parliament for a vote of confidence today. Iran. The Iranian parliament is examining a bill aiming “to protect the nuclear rights and achievements of Iranian people.” The bill would oblige the Iranian government to immediately stop implementing the November 2013 Joint Plan of Action if the U.S. Congress approves new sanctions against Iran. The Iranian bill also calls for an increase in Iran’s enrichment program and building of a heavy water reactor at Arak, two actions limited under the current deal. President Barack Obama has pledged to veto Congress’ proposed legislation for new sanctions, which would in theory keep the Iranian bill from being passed. It is unclear when the Iranian parliament will vote on the proposed legislation. UN- Israel. The United Nations Human Rights Council announced yesterday that New York Supreme Court justice Mary McGowan Davis will replace William Schabas as chairperson of the panel commissioned last August to investigate whether war crimes were committed in the latest Gaza conflict. Schabas resigned from the commission on Monday to avoid becoming “an obstacle and distraction” to the work of the panel after Israel accused him of “a blatant conflict of interest.” Israel had formally complained to the UN Human Rights Council last week over paid consulting work Schabas had done for the Palestinian Liberation Organization in 2012. Israeli Prime Minister Benjamin Netanyahu called yesterday for the Gaza inquiry to be terminated once news of Schabas’ resignation broke. Jordan-Israel. Jordan announced on Monday the return to Israel of its ambassador, Walid Obeidat, three months after he was recalled in protest of clashes at the Temple Mount/Haram Al-Sharif. A Jordanian government spokesman said that Jordan had seen “significant improvements” in the access to the mosque that Muslim worshippers were granted on Fridays, and that there had been better coordination on tourist visits between the Israeli authorities and the Islamic authorities who administer the site under Jordanian supervision. Israeli Prime minister Benjamin Netanyahu welcomed Jordan’s decision.